A tribute to an all too rare celebration of fifty years of marriage. 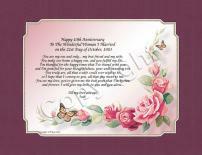 Personalize this beautiful anniversary poem created especially for the couple's 50th wedding anniversary. They're sure to love it! 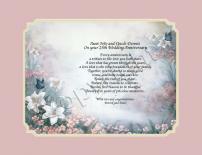 A very nice anniversary poem written specifically for a couple celebrating their 25th wedding anniversary. Personalize this gift with each of the couples names and with the sentiment of your choice. Personalized in less than 1 minute! A beautiful anniversary gift from one spouse to the other. 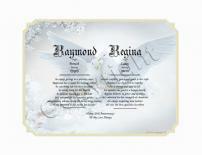 Shown for the couple celebrating 10 years of marriage but can be personalized for any anniversary. A gift that expresses your love and will be treasured for years to come. 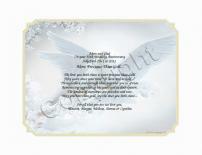 A thoughtful anniversary gift that includes the first name, name meaning, name origin and eight virtues for each name. A fun and interesting gift that will be remembered forever! The perfect gift for the couple that has everything! 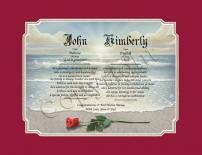 The meaning and origin of each of the couple names displayed side by side on one of the most beautiful art backgrounds. A cherished keepsake for couples of all ages! A timeless first name meaning gift to celebrate the couples anniversary. 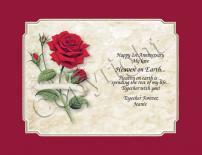 You can personalize the sentiment to commemorate their specific anniversary from the 1st to the 50th and beyond. A truly thoughtful personalized gift the couple is sure to appreciate. Personalize a beautiful anniversary gift for any couple and include the names and sentiment of your choice. A truely unique and cherished gift!